Oy! Have I said lately that I just can't win? So, Malcom has a time conflict. I had Emailed him to confirm my 11am time at the glass saw, and it turns out he has a TV interview for an art crawl that ended up getting into that slot. He would be able to fit me in tomorrow, but that won't do me any good because I'm only off on Wednesdays. But I have a good shot of making it out there this afternoon sometime between 1 and 3. I gave him my cell phone number and told him to call me. His studio is only about 15 minutes away from me, so it won't take me long to get there when he calls. Otherwise, we'll have to schedule for next week which will push me one more week behind on this project. NOT happy! 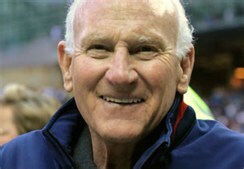 Harmon Killebrew died yesterday. For those of you who are not baseball fans, he was one of the nicest people ever! His standard biography states: Born June 29, 1936, Harmon was signed by the Washington Senators in 1954 at the age of 17. Harmon “Killer” Killebrew amassed numbers matched only by the game’s very elite. In his 22 years of hard work and productivity, he was named American League All-Star 13 times, the 1969 American League MVP and a six-time American League home run leader. In 1984, Killebrew joined baseball’s immortals with his election into the National Baseball Hall of Fame. He was so respected in baseball that even though the Twins were playing an away game in Seattle, the Mariners pulled down all team flags and flew their own flag at half-staff in respect. They also held a minute of silence. This from an AWAY game. Pretty amazing. We'll miss you, Harmon. You were a very classy and polite player and will be remembered throughout the league as a beacon. RIP.